Kanuhura, precious island languidly set on the warm Indian Ocean, in the middle of the bright atolls of the Maldives, can be described as a unique "timeless castaway chic experience" for travellers seeking laid-back island living. The forces of the elements are the architects of this true paradise, a place of beautiful, natural enchantment. Kanuhura's offers a very tasteful celebration of luxurious island living with a sense of bliss, framed in soft colours and natural materials used, combined with tropical elegant design enhances the harmony of elegance in fusion with timeless Gypset chic. 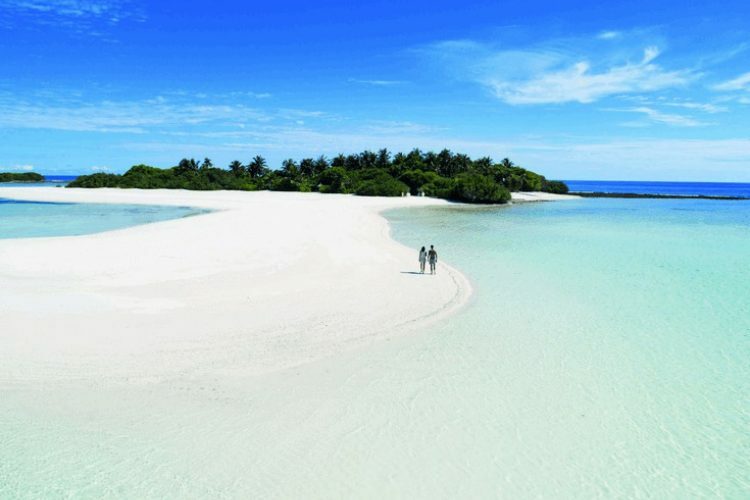 The secluded and tranquil island resort of Kanuhura, Maldives, a five star luxury resort. Famed for its laid-back luxury and authentic, natural Maldivian charm, the award winning Kanuhura offers the highest standards of accommodation, service and culinary experience. Every effort has been made to retain the natural beauty of the island and wherever possible, employ the use of only natural materials. The resort is located on a slim, oval island, one kilometer long and 200 meters wide, in the northeastern part of Lhaviyani Atoll, to the north of Male. The coral island is blessed with white powder beaches, coconut and palm trees, and crystal clear turquoise waters of the Indian Ocean. The Seaplane transfers is mandatory to every person staying at our resort. Flight details are required to arrange the seaplane transfers. US$ 550.00 Transfer fee per adult per stay, US$ 330.00 Transfer fee per children under 12 years old and free for children under 2 years old. Everything was more than wonderful, and my expectations were honestly exceeded, actually paradise in the ground. I was very impressed and welcomed by the staff and we stayed, throughout my stay, smile, respect and honesty in dealing with us. We had a truly lovely stay at Kanuhura. The staff was friendly and professional, the food was spectacular, the service was amazing, and we had a lot of fun on the island. Kanuhura offers a variety of different water based activities and the trip itself had been an experience that our family won't forget. We would most definitely come and visit here again. Expect to get pampered in Kanuhura island, apart from its unparalleled beauty that baffles the visitors, it has a resort of the same name and it comes equipped with luxurious 5-star hotel decor and luxe amenities. Here, you can rejuvenate in the spa the resort provides as well as a private outdoor shower and a personal villa host. If you want to spend family time in fun activities, this island has various such things to do, like diving and snorkeling. You may as well as indulge you kids in a Kids Club where entertaining activities like beach volleyball, tennis, indoor games etc are made available. First of all, it's Mr. Chye not Mr. Choong. Surname comes first in the name. The staff are friendly and villa host, Kazu is friendly and helpful. White sandy beaches for both sunrises and sunsets. Pristine clear azure blue waters and well landscaped gardens. Great spa facilities. The accommodation is spacious and comfortable and the outdoor shower is great. Free bicycle to roam the island in and free boat ride to sister island. And the island is isolated and is quiet which is great. Airport arrival pick up to seaplane and seaplane transfer from resort back to airport well organised and the 45 minute flight is worth taking. Had a great relaxing time at the resort. Kanuhura measures approximately 1000 meters in length and 200 meters in width, with a north-south orientation. It offers the best in Water Sports and diving. This resort has 80 villas, tastefully furnished with gypset sophistication and a modern touch. Featuring a bounty of natural materials, the villas are complemented by a private wooden deck stretching to the beach or over the lagoon. Travel is by seaplane and is around 40 minutes from Velana international airport at the Maldives capital, Male'. The seaplanes, privately run by Maldivian Air Taxi Services, operate a schedule to accommodate international arrivals and departures. A private waiting lounge is available while you wait for your transfer to Kanuhura. It’s close to impossible to find a fault with kanuhura. I certainly can’t think of a serious one after having spent 9 days on the island. Everything was pretty much perfect: the location is heavenly, the service is at once discreet and proactive and the food is superb, achieving that most hard balance among variety, diversity, quantity and quality. The island can be walked round and explored on foot (in fact one can spend a whole week barefoot) and beyond the coarse white sand and the crystal clear turquoise warm waters, the feeling, at times the awareness, of being the only person on the beach is invaluable. The staff is efficient, discreet, proactive and will truly go the extra mile to make your stay not only unforgettable, but truly yours. Anything from getting you bathrobes and slippers of your actual size to understanding your schedules in order to replenish the fruit platter in your room at the right moment. The cuisine is one of the aspects where the effort and dedication of people at kanuhura really shine. It amazingly manages to offer an immense, daily-changing variety of dishes, breakfast and dinner (in the buffet restaurant), with a consistently high quality. This is far from trivial (especially when you’ve got other à la carte restaurants running concurrently!) and a merit which I feel should be recognised. After kanuhura, I don’t think I’ll be able to go back to the classic seaside holiday any day soon! We had a fantastic time. Difficult to fault the resort, service, friendliness and attention to detail. I guess the only one criticism is the food service at the pool bar. It suffers I believe from the distance between the bar and the kitchen. From a warm welcome to a warm goodbye it was perfect. The service, always with a smile, was excellent. For transportation on the Island you have your own bycicle and we loved it. No make-up, no shoes, no worries. Complete relaxation on this Island. Restaurants and bars with good food and drinks. Lunch on the sister Island is a real must. As is also private dinner on the isolated sister Island. Be prepared that for the private BBQ there is really a lot of food. We were lucky with the dolphin safari, there were hundreds. A real dream. If you want to visit the turtle farm on another Island, make sure you have all the details of this excursion, otherwise this could be a disappointment. We had another idea of this excursion. The Spa also is a must. Perfect ambiance and professional therapists. Crystal massage is top. You can walk around the island in half an hour. We had the Beach Pool Villa. Excellent. Nice decoration. Big half-open bathroom. Walk-in closet. They thought of everything. Slippers, bathrobes, beach bag etc etc. Nice veranda and shallow pool to dream in. Excess to the beach with you own furniture. Large white sandy beach. Paradise view on the sunset. At this side the hydro-airplanes are landing and taking off. That goes with some noise, but it is never boring to see this. They aren't allowed to fly in the dark, so no big disturbance there. Immerse yourself into an amazing tailored experience. The best hotel in Maldives, resort in Maldives and home in Maldives: with a 360 degree beach, exceptional dining experience, a warm and professional team and not the last—some disruptive surprises prepared by the team to make each moment extraordinary. Feel the privilege to live timeless happiness with the ones you love. Immerse yourself into an amazing tailored experience. The best hotel in Maldives, resort in Maldives and home in Maldives: with a 360 degree beach, exceptional dining experience, a warm and professional team and not the last—some disruptive surprises prepared by the team to make each moment extraordinary. Feel the privilege to live timeless happyness with the ones you love. A memorable holiday in perfect surroundings with outstanding staff to make the experience even more wonderful. I had a fantastic time from the very first moment I stepped off the plane in Male to being greeted and transported to a private lounge to wait for the seaplane to the moment I left the beautiful, magical island. The accommodation was perfect (including the little gecko on the outside wall). I enjoyed my private pool, relaxing in it numerous times each day. All the staff at the Sun Dive centre were amazing and I had a wonderful time on each dive, especially seeing the Mantas two days in a row. The food was amazing, it was lovely to be greeted and called by my name as I went for breakfast or dinner, such a personal touch. Adam my host made sure everything was perfect, checking in with me a number of times each day to double check I had everything I needed and organising things for me. I was made to feel most welcome by all staff but in particular the management team made great effort to ensure I was enjoying my stay, thank you :) Everything was spotless thanks to the teams cleaning the rooms, cleaning the pool and maintaining the grounds. Thank you for a truly magical holiday, I hope to be back soon. My wife and i took a short 2 day break at Kanuhura. The property, after the renovation completed in 2016 end, has a chic classy look. The bars, restaurants and the service are outstanding. We, of course, given the limited time could not try out all the dining outlets. Veli was outstanding for a dinner under the stars - good selection of vegetarian Asian cuisine for us. The villa host was very knowledgeable and helpful in organizing our reservations for dining. conch bar provides a relaxed ambience to chill over a drink at any time. Every aspect of our vacation at Kanuhura was amazing. From the delightful lounge at the airport in Male to the warm send-off at the conclusion of our stay, it all exceeded my expectations. Every staff member was polite and friendly, the food was amazing, our "hut" was just beautiful, and the island was gorgeous. The designs, colors, even the staff members' clothing were all lovely. I've traveled quite a bit and stayed at some fine resorts, but this one tops my list, just because all of the details were so well done. It's a long way from my home in Chicago, but I want to go back! Thank you all for making my stay so memorable!